I bought it at the Willow Conference - had it signed of course:) and read it on holiday in Wales. The analogies with food and meals really connected with me as I read - like a delicious and beautifully prepared meal, I wanted to read more and could have wolfed it down, but chose instead the restraint of reading slowly. Each chapter is self-contained - an observation, a recount of an ordinary event in her life. That's what resonates so well as you read it -thinking "that's my life" "I've felt like that" "I wasn't sure other women felt like that too". It's about seeing God in the ordinary. It's about real , authentic life. It's about learning and growing through all of life - sad and hard times included. To me, it's a picture of what Romans 12 v 1 is like in real life for a Christian woman living in the west in 2010. 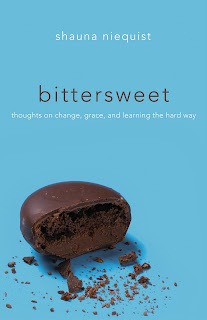 Shauna's doing a blog-tour of Bittersweet, and as part of that is offering to giveaway a book when it's reviewed , so she will send a free copy of Bittersweet to one of my blog readers - cool hey? SO...if you write a comment on this blog, with a short account of a bittersweet moment in your life, you'll be entered for the giveaway. It's going to be a kind of lucky-dip to pick the winner really, (rather than "the saddest story wins" !) If you post something on Facebook or Twitter, send me that link as a comment to this blog and you'll be entered too! Can't wait to hear your thoughts .